And with taping already rolling we will definitely see a teaser trailer from TV5 anytime soon. The series is directed by Joel Lamangan. Here is Clau with co-star Cesar Montano. 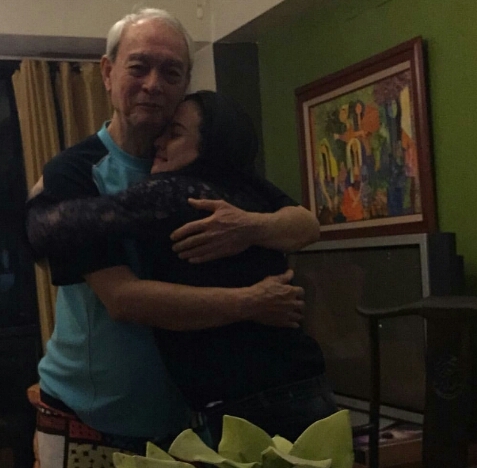 Claudine Barretto was reminiscing her past with the late actor, Rico Yan. On her Instagram recently, the actress shared a letter from the actor and their photo together. The said photo had a caption, “We @tinamarieyan miss u terribly”. Because of this, the name of the actor became one of the trending topics today on Twitter. Today is September 29 and it’s super extra special day for Claudine Barretto. And her fans on social media couldn’t help but be moved by the emotions. Firstly, it’s Clau’s Dad’s birthday, she posted a photo of her hugging her Daddy and told him how happy and how proud he is to have a great father. Today also happens to be the premiere night of Etiquette. The feedback from social media is overwhelming and fans of the casr are pledging their support to watch the movie. Clau recently revealed she had a ruptured cyst which was discovered when she underwent treatment for UTI over the weekend. We wish you good health and declaring super mega blockbuster opening for EFM Clau. We love you! Following her succesful promotional tour with fellow Etiquette for Mistresses stars Kim Chiu and Iza Calzado in Cebu, the Optimum Star Claudine Barretto revealed she has cyst. During her visit to her physician, her UTI lead to the discovery of a ruptured cyst which made it more painful. After the session, she had to leave for Show to promote her comeback movie. Her fans on social media wish her well and good health. Etiquette for Mistresses opens September 30, 2015 in cinemas nationwide. Today, Cebu fans of Kim Chiu, Claudine Barretto and Iza Calzado are happy seeing them together on one stage at SM City Cebu. The Chinita princess thanked them for their overflowing support. In a photo shared by Kim, you can see that the venue was full of people. Their visit was part of the promotion of their upcoming movie, “Etiquette”. The film is under the direction of Chito Roño and opens this September 30 on cinemas worldwide. Other cast members of the movie are Kris Aquino and Cheena Crab. Recently, the actress, Claudine Barretto was brought to the hospital due to urinary tract infection. The news was confirmed by herself via Instagram. Claudine posted a series of photos , with showing her being attended by physician and undergoing test. Her co-stars of the upcoming movie entitled, “Etiquette for Mistresses” Kim Chiu and Kris Aquino wished her well. Meanwhile, followers posted their messages on IG saying ‘Ms. Claudine get well soon’. Some of them posted suggestions on how to deal with UTI. On Monday July 20, Marjorie Barretto posted a photo of her with Sister Claudine Barretto. Claudine touched by the birthday message of her older sister. Meanwhile, netizens reacted on the gesture given by Marjorie and Claudine for each other. Ely_gonzales said, “We are so happy for you and your family ms @marjbarretto! Let this be the start of a wonderful journey with the whole family, free from hatred and bitterness. True, it is not easy to forgive and forget but let God be the center of your heart and He will heal you from all the anger and hatred. It is not an easy journey, but just keep on praying. God bless. Claudine celebrates her birthday today, July 20. Followers and fans of the actress, Claudine Barretto are happy seeing her pictures posted to her Instagram account. The photos were taken during her recent birthday celebration. Claudine celebrated her birthday with her sister Marjorie Baretto, Clau’s parents and nieces. After the feud following their breakup, the estranged couple Raymart Santiago and Claudine Baretto are in good terms again. The ex-couple met recently for the 11th birthday celebration of their daughter, Sabina. On their respective Instagram account, Raymart and Claudine shared a photo on the event. On his part, the actor posted a video with caption, “Happy birthday my Sabina…I love you”.